When you visit an accommodation facility such as restaurants and lounges, you certainly can find the uniqueness of the good spot of interior design, the uniqueness of the food served, or the sights on offer. Likewise, when you visit Ashtari Villa Beach View, it offers its own uniqueness and excitement that probably you will not find in other places. In recent time, the popularity of Lombok is going up to the top. Adjacent to the island of Bali, which was already well known to the world, the island of Lombok seems to indicate its existence in the world of tourism. Many visitors travel destinations in Lombok is an alternative for tourists who are hungry for a tourist destination so close to nature. Lombok offers a variety of destinations and attractions began to nature, culture, art, history, religion, culinary, and others. In fact, some of the tourist destinations in Lombok are still very thick with a natural touch that adds to the appeal for visitors. When you choose a villa, resort, hotel, or a variety of other accommodation facilities while on holiday, you certainly do not just focus on how the room facilities would you use. You also need some supporting facilities such as the existence of the restaurant, children’s playground, swimming pool, or other. This is why every villa, resort, or similar other lodging strives to offer a wide range of facilities that will be an attraction for visitors as well as satisfying. Ashtari Restaurant and Lounge do the best to give satisfaction to visitors. One of them is offering a restaurant with beach view extraordinary. Many visitors who do not just want to stay there but also want to enjoy the stunning scenery while enjoying a meal in the restaurant. The visitors Ashtari Villa Beach View can enjoy a variety of menu offerings delicious meal while enjoying the amazing view from the restaurant. 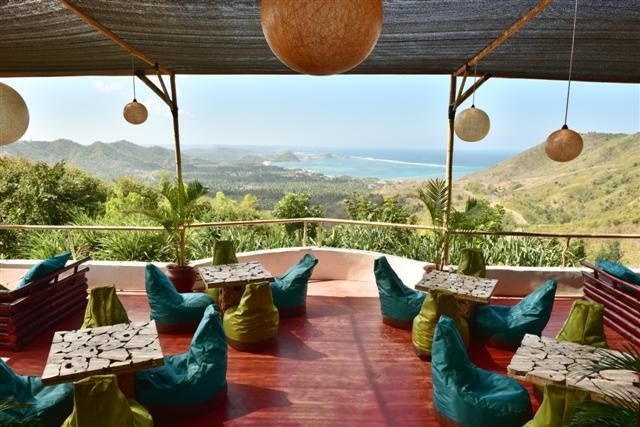 This restaurant offers a beautiful of Kuta Beach Lombok as beach view is so cool. In addition, the area is surrounded by tropical forests that create an atmosphere to grow cool. The beauty and comfort is also supported by the unique architecture of the restaurant and ethnic nuance that will make every visitor really feel calm and comfortable. The restaurant is also available in several seating options are like sitting on the floor, chairs, or couches. Although the restaurant and lounge is located on the roadside, with the position of the building leading into making this area still presents a quiet atmosphere. With the incredible view that there is in this place, the price of food presented menu at this restaurant is still affordable. In the front area, you can see the area that yoga can indeed be used to perform the sport activity. One of the unique things that are in place is when a visitor on the stairs before entering the entrance, visitors is required to open footwear. This is likely to be to keep the restaurant area of ​​the sand because the location of this restaurant not far from Kuta beach which is a beautiful view in the restaurant. If you really want to enjoy the convenience to enjoy meal while looking at beach view, already mentioned, you should choose a location on the outdoor terrace. You can order a full menu of Italian dishes or Indonesia such as French fries, vegetarian samosa, or a variety of other dishes menu. Therefore, you should not miss to stop by and enjoy Ashtari Villa Beach View when you visit Lombok.